Taker were a Christian heavy metal band out of Virginia, USA who were mostly known for their inclusion on the East Coast Metal compilation. (This compilation also introduced Believer to the masses.) 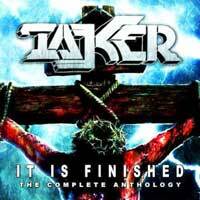 Taker's two songs from that compilation are included here (tracks 9-10 of disc one). According to the liner notes the band was unhappy with the production of these two tracks as they wanted something heavier but their producer wanted something along the lines of "Pyromania" by Def Leppard. Taker's sound is old school/traditional heavy metal not unlike Armored Saint, Sacred Warrior, Omen, Obsession, Tyrant, etc., thus the cleaner production does them no justice. Rather Taker were about crunchy riffs, power chords. melodic guitar solos, a pounding rhythm section and powerhouse clean vocals from Kevin Potter. It's unfortunate that this band wasn't given a chance by a proper record company. Apparently there was label interest but the tides in heavy metal were changing by 1987-88 from traditional heavy metal to glam metal or thrash metal. Taker are neither and thus interest waned. Besides these two tracks there are the four tracks from the band 1987 demo tape, a live rehearsal version of "Living By Faith", three tracks that were recorded for Image Records in 1987 (tracks 6 - 8) and the bands 1989 "Blood" EP. By this point original vocalist Kevin Potter had left the band and was replaced by Rob Kreiner. Though his vocal style is comparable to Potters, he doesn't quite have the control and charisma the Potter has. The songs themselves are slightly more progressive than the earlier material, not unlike early Fates Warning. Lyrically Taker were all about sharing their Christian faith, loud and proud. Some Christian bands from this ear tended towards the cheese of "rocking for the rock", while others made their message more subdued. Taker fall right in the middle, offering songs about the love of Jesus and warnings of the consequences of sin. As might be expected the sound quality isn't perfect, as much of this is demo material from the 1980's. However, it's not unlistenable either and Ysidro "Sid" Garcia did a great job at making all the songs flow together from beginning to end. All in all, rather than being a greatest hits collection, this is an everything collection. Those fortunate enough to get into the early pre-orders received a 2-CD version with disc two containing live songs from 1988 as well as a few other extras. The CD contains a 12-page booklet with plenty of reading material and photos of the band. The 2-CD version came with an extra insert as well.